K hukha has been extremly fortunate to have some of the most honourable individuals who devoted their valuable time and resources to develop and achieve immense benefits for the Khukha community. Khukha community is proud of Captain Dr. Mohammad Arshad's achievemnt to become first qualified Doctor of Khukha. 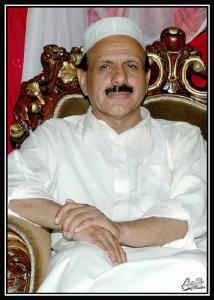 C aptain Dr. Mohammad Arshad is son of Haji Noor-ul-Hassan (Late). He is the first Bachelor of Medicine and Bachelor of Surgery, (MBBS) Qualified Doctor of Khukha. A typical MBBS doctor in Pakistan gets his degree after a long, painful and frustrating journey. DR. Mohammad Arshad is currently living in Dina and is successfully running his own private hospital known as 'Family Hospital Dina'. Dr Arshad is an examplary personality and it’s the sole reason why I chose medical profession. Dr. Arshad received his basic Matric and Intermediate (F.Sc) education from CADET COLLEGE, HASSANABDAAL, and achieved MBBS degree from the renowned and top medical college of Pakistan KING EDWARD MEDICAL COLLEGE, LAHORE. He has served in the army as a Captain, and also been employed in ARMY AVIATION of Pakistan where he had successfully been trained as a Helicopter Pilot...during this period he flew a helicopter above our village khukha and rest of the punjgraeen. In extracurricular activities Dr.Arshad is a very keen and talented cricketer, he is the originator and founder of cricket in Khukha.